In between all of the witty and pithy comments on the renovation travails, let's not forget that part of this blog is to help us discover the beauty that is Yonkers. 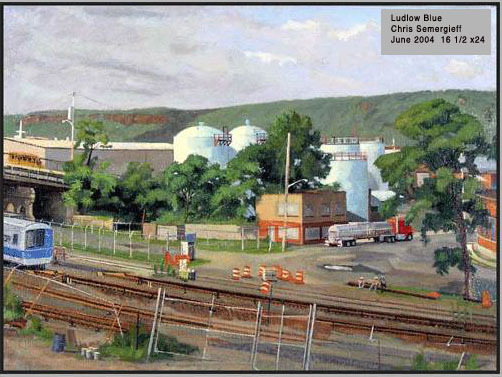 I found a very good website by Yonkers artist Chris Semergieff (website at www.semergieff.com) that does just that. Chris (and truthfully, I'm not sure if Chris is a he or a she, and it doesn't actually matter) does a really good job of capturing the urban beauty of Yonkers. 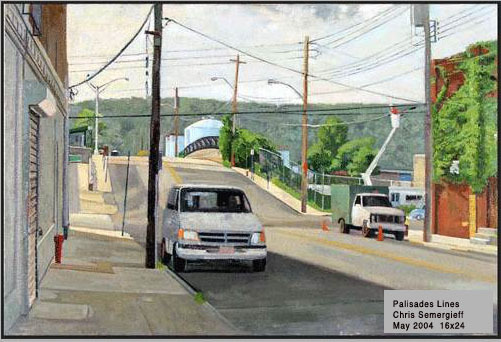 While I think it might seem a little cleaner than the Yonkers that I know, the art captures something of Yonkers mercurial beauty. It seems to me that most industrial cities that are past their prime (Yonkers and Providence being the ones I have most experience with) have the ability to seem either terribly beautiful or excruciatingly depressing based on the day (and the sunlight) Sometimes it's the same day,even! Chris has been able to capture a little bit of the beauty. Check out Chris's website for a larger gallery of paintings, plus a curriculum vitae. www.semergieff.com Chris also teaches at SUNY Stony brook and Manhattan Community College. Comments on "Yonkers artist Chris Semergieff"
Chris is a he, and he teaches drawing and painting at Stony Brook University. He's a really great teacher!